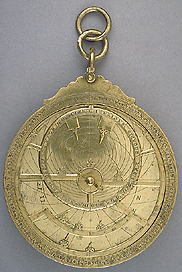 Epact: Astrolabe unsigned, 14th century ? This unsigned and undated instrument has very similar features to Islamic astrolabes but is engraved with Gothic numerals and letters. This suggests that it would have been made in Spain at a relatively early date, probably in the 14th century. The star pointers are unnamed and the shadow square is a later addition, so it was probably left unfinished.